Many American steel guitarists of a certain age remember Lucky Oceans as Asleep At The Wheel's first steel guitarist. These days, his name is too often preceded with "What ever happened to..." here in the states. Not so in Western Australia. Lucky moved there 3 decades ago to become a popular and celebrated musicologist, hosting The Daily Planet on Australia's ABC Radio National. And of course he's also WA's foremost steel guitarist. 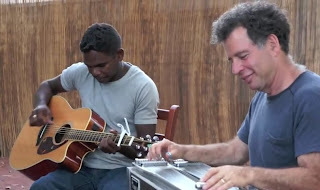 The big musical news from Western Australia this week is that indigenous singer/songwriter John Bennett has just released his first CD, and Lucky Oceans is playing steel all over it. Lucky laid down his parts in the studio before meeting John, as they live at opposite ends of the huge province. They are getting together this week, though. John and Lucky will be performing in concert at ABC Perth's Studio 620 on Monday, July 4th. Then Lucky will be featuring John Bennett on his radio show Tuesday afternoon. "[Bennett's songs] speak of an undeniable love of people, tradition and the land. But even though these songs were born out of an ancient region, there isn't a traditional instrument to be heard. It's all guitars, bass, drums, pedal steel and modern pop and gentle country rock rhythms." John Bennett's CD is on the Too Solid record label.